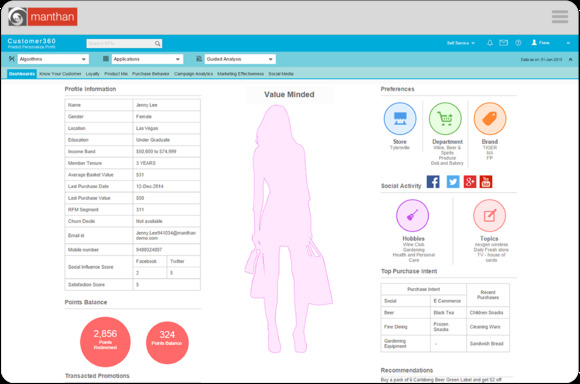 Customer360 is Manthan's longstanding customer-analytics offering, and it offers an array of packaged descriptive, predictive and prescriptive analytics capabilities. Algorithms are optimized for Apache Spark, giving marketers the speed of that data-processing tool as they analyze terabytes of data to do things like make campaign decisions or predict churn. Now Manthan has re-engineered Customer360 for Hadoop with new data-management, auto-scale and real-time computing capabilities. For example, users can get a single view of data by harmonizing social, click-stream, transaction, loyalty and other historical information into a transformed data lake that's ready for analytics. They can then analyze the data at scale, aided by Apache Kafka for real-time "listening" capabilities, with dashboards to help track performance and show promotional opportunities. "Given the predominance of Hadoop as the big-data solution of choice for most enterprises, connectivity to Hadoop is table stakes for customer-analytics vendors at this point," said Brandon Purcell, a senior analyst with Forrester Research. "Almost all of them offer it in some form or another." That said, Manthan's solution has two interesting points of differentiation, Purcell added. First is the fact that its algorithms run on Apache Spark, "which offers the quickest way of processing massive amounts of data across a distributed file system," he said. Second, Manthan's customer-analytics tool is built for the business user, meaning that it "further democratizes analytics, giving business analysts access to big data without having to rely on IT for their data queries."